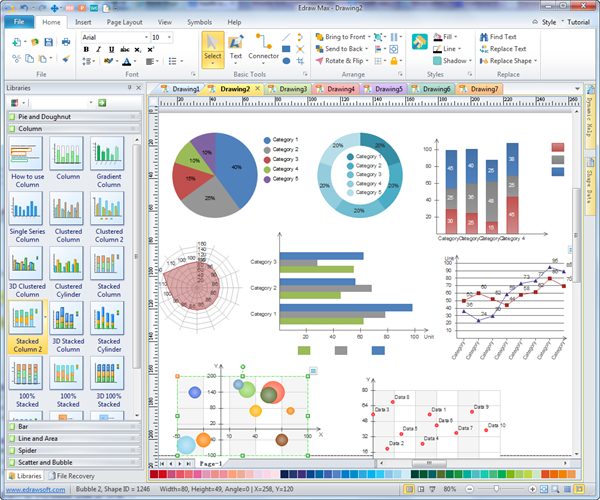 Edraw chart software is an ideal choice for making charts and graphs in minutes. You do not even need the basic drawing skills, just drag-and-drop the chart shapes you need, then the chart you want is finished in a short time. 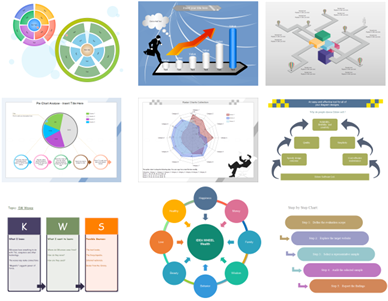 Charts help to turn long, exhaustive reports into clear, attractive presentations. Human brain process pictures a lot faster than text. When you display information in charts and graphs, it is easier to understand and interpret the data. Edraw chart software supports many kinds of charts to help you display data in ways that attractive and meaningful to your audience. You can always easily get the type you want from a list of standard or custom chart types. Edraw diagramming package has included chart software which is powerful for drawing all kinds of charts like column chart, bar chart, pie chart, doughnut chart, line chart, scatter chart, area chart, bubble chart, comparison chart, etc. It has perfected over 10 different chart types so you can view things from nearly every conceivable angle. Edraw chart software provides you free maintenance update and lifetime upgrades guarantee. Give it a try and you will never regret that. Just select the chart shapes you like, Import data, and then Edraw will build the chart or graph for you, automatically. When you draw charts, you will discover abundant chart symbols and easy-to-use tools available for you. Edraw offers support for exporting diagrams to various formats, including Microsoft Office(Word, Excel, PowerPoint, etc), PDF, SVG and many other graphic formats. On the File menu, point to Export & Send for Export options. You can also import your Visio documents and then modify them in Edraw chart software. Our goal is that your work and life will be much more easier through our efforts. Visualize market moves, potential breakouts and related numbers, - enabling you to analyze the market in ways that make the most sense to you. Extensive chart linking, annotating capabilities, transparency and data-forward design are just a few of the features that simplify chart analysis in Edraw. Virtually every graphic and other element of our charts can be customized, empowering you to personalize charts to perfection and maximize your insights of the markets. Edraw is dedicated to offering quality chart software at affordable price. Please be assured that your Edraw chart software is absolutely a wonderful bargain. If you compare our price and quality with other drawing software, you will be surely happy that you have made a wise decision. Got a question? Email us. Edraw experts are always ready to help you. You can rest assured that we will always stand by. Whenever you got a question, we are ready to respond. Whenever you hesitate to choose a chart software, come to visit us and give yourself a free trail of Edraw chart software. Edraw chart software has many chart examples and templates. Some of them are from our kind users who share their diagrams or charts made via Edraw chart software. Starting from ready-made templates to make your own chart is the fastest and simplest way. Here are some exmaples created by Edraw.